CHICAGO — Federal agents raided the offices of powerful city Alderman Edward Burke on Thursday, papering over doors and windows to keep out prying eyes, CBS Chicago reports. FBI officials confirmed the raids Thursday afternoon. "Our agents are executing search warrants at multiple locations today. We have no further comment," FBI Chicago spokeswoman Janine Wheeler stated in an email. In addition to serving as an alderman, Burke, a Democrat, is also an attorney and partner in the firm Klafter & Burke, specializing in property tax assessments. Representatives for his law firm said they didn't know anything about what was happening at Burke's aldermanic offices, CBS Chicago reports. Burke's law firm represented President Trump for years, helping him challenge his property tax assessments for Trump Tower. However, Burke stopped representing Mr. Trump earlier this year, citing "irreconcilable differences," according to published reports. Federal agents were searching Burke's office on the third floor at City Hall, after the doors and windows were covered with brown paper. 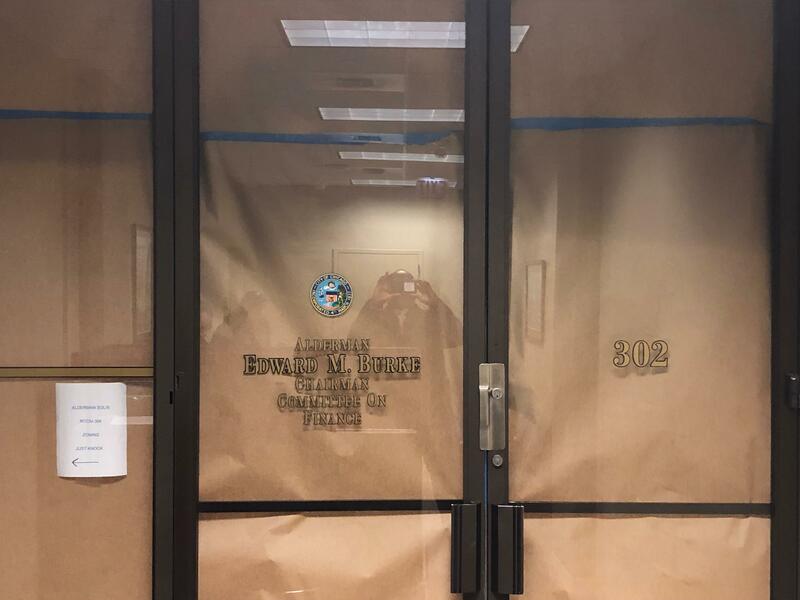 City Hall employees working in an adjacent office arrived around 8:30 a.m. to find Burke's office papered over. When a reporter knocked on the door of Burke's office Thursday morning, a man in a suit opened the door and simply said "no comment." Brown paper also covered the doors and windows for much of the day at Burke's 14th Ward office on the Southwest Side of Chicago. A man who walked out of the back door of the ward office Thursday afternoon identified himself as a member of law enforcement, but declined to comment and referred questions to the FBI's press office. There has been no sign of law enforcement activity at Burke's home on the Southwest Side. Francisco Ortega, who owns Gracias Bakery near Burke's ward office, told CBS Chicago he saw two men who appeared to be agents trying to open the back door of Burke's ward office around midnight, and then go around to the front door when they couldn't get in. "As you are aware, there have previously been several other investigations such as this. In every instance we cooperated fully. And in every instance nothing has been found. So once again we will be cooperating fully and I am completely confident that at the end of the day nothing will be found amiss in this instance either." Thursday afternoon, people were seen walking out of Burke's ward office carrying several boxes, a computer, and a couple display monitors. The brown paper covering the front windows and glass doors also was removed. The alderman's brother, Illinois state Rep. Dan Burke, D-Chicago, said he's not worried about the raids on his brother's offices. "I know my brother's character and who he is; fifty years of service, longest serving city councilman in America. I have no question, no concern about any wrongdoing," Dan Burke said. Coincidentally, Burke's wife, Illinois Supreme Court Justice Anne Burke, was sworn in for a new term on the bench Thursday morning at her chambers in downtown Chicago. Alderman Burke is chairman of the powerful Finance Committee. A former Chicago police officer, he first took office in 1969 when he was appointed to replace his father, who died in office. He has filed to run for re-election in the 2019 election. Burke hasn't faced a challenger in an election since 2007, when he coasted to victory with nearly 90 percent of the vote. However, four challengers have filed petitions to get on the ballot to run against him next year.